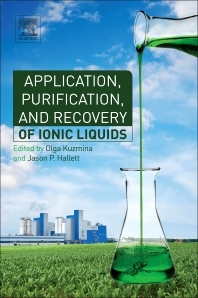 Application, Purification, and Recovery of Ionic Liquids provides a comprehensive overview of the usage of ionic liquids (IL). The book gives a description of the methods used for recovery and purification of ILs, a summary of the economic aspects of using ILs, and a review on the toxicity data of ILs. It is written for researchers, scientists, and engineers working with ILs, their properties, and usages. The book not only describes the chemical aspects, but the economic and environmental aspects as well, making it of particular interest to professionals applying this technology. Dr. Olga Kuzmina is a postdoctoral research associate at Imperial College London. She obtained a PhD in Chemistry at the Friedrich Schiller University of Jena, Germany, and has a few years of industrial experience working for leading chemical companies worldwide. Dr. Jason P. Hallett received his PhD in Chemical Engineering from the Georgia Institute of Technology. He joined Imperial College London, first with a Marshall-Sherfield Postdoctoral Fellowship in Sustainable Chemistry and in 2014 was appointed a Senior Lecturer in the Department of Chemical Engineering. He has authored over 60 articles and holds 4 patents. His current research interests involve the solvation behaviour of ionic liquids and the use of ionic liquids in the production of lignocellulosic biofuels and sustainable chemical feedstocks. This research is supported by both the EPSRC and industry.